In 24 hours the Federal Reserve will announce its monetary policy decision and everyone expects interest rates will remain unchanged. The Fed has done a great job of preparing the market for steady rates but no changes to monetary policy doesn’t mean no volatility for the U.S. dollar. The reason why the April FOMC meeting is important is because it will help to shape expectations for June. There’s no monetary policy in May so if the Fed wanted to prepare the market for possible tightening, they would need to tweak this month’s FOMC statement. The problem is that the odds of a dollar positive and negative outcome is roughly balanced. With the global markets stabilizing and commodity prices moving higher, the Fed has less to worry about internationally but domestically, growth has slowed. So even though no changes in monetary policy is expected at this month’s meeting, the greenback could still have a meaningful reaction to FOMC based upon the Fed’s assessment of the economy. Scenario 1 -- The FOMC statement remains virtually unchanged = Mildly negative for the dollar because it would imply an ongoing split within the Fed and reluctance to raise interest rates. The balance of risks statement was removed from the last 2 monetary policy statements because policymakers could not agree on the outlook for the economy. So if the risk statement is absent again, the dollar could spiral lower as the market interprets it to mean no rate hike in June. If the risk statement reappears and the Fed describes the risks are balanced, the dollar will soar as the chance of a June hike increases significantly. Aside from the risk statement the central bank’s comments about recent data disappointments will also be important. If they say the deterioration is transitory, it will help the dollar. 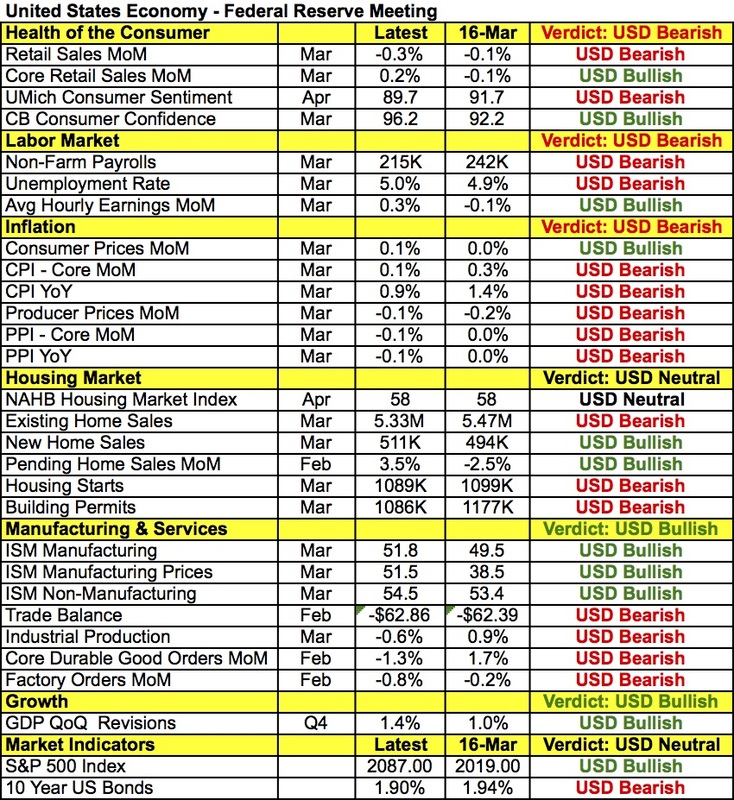 The following table shows how the U.S. economy performed between March and April. An initial glance shows more deterioration than improvements with consumer spending, labor market activity, inflation, production and trade weakening. However there are glimmers of hope. The rally in U.S. stocks helped to boost consumer confidence as measured by the Conference Board’s report, consumer prices are still moving upwards as gas prices increased. New and pending home sales rebounded and most importantly manufacturing and service sector activity accelerated. With average hourly earnings on the rise, the Fed could argue that the economy will regain momentum in the near future and with prices rising, they need to get ahead of inflation expectations. In other words while the data suggests that the Fed should be less hawkish, they could also find reasons to stick to their plan of raising rates twice this year. The Federal Reserve’s Open Market Committee changes every year and 2014 in particular iss a big year for the Federal Reserve because there are a number of new faces on the Federal Open Market Committee or FOMC. With her official confirmation on Monday, Janet Yellen will become the first woman to lead the world’s most influential central bank. Having served as the Vice Chair of the Federal Reserve since 2010, she is not new to the FOMC but her voice will be heard much louder this year in the highly anticipated quarterly post monetary policy meeting press conferences. Yellen is a vocal dove that puts growth ahead of inflation but actions speak louder than words and her vote to taper asset purchases in December suggests that as Fed Chair, she may not be as dovish. Every year, the makeup of the Federal Open Market Committee also changes with previous voters rotating out and new voters rotating in. This year’s policymakers have the huge responsibility of determining the pace that asset purchases will be tapered and when Quantitative Easing will end. Two major doves favoring easier versus tighter monetary policy (Evans and Rosengren), one moderate hawk who favors tighter policy (George) and one centrist (Bullard) will be rotating out of voting positions. They will be replaced by Plosser and Fisher, two major hawks, Pianalto a moderate dove and Kocherlakota, who shares a similar bias as Yellen. Former Bank of Israel Governor Stanley Fischer has also been nominated to replace Yellen as Vice Chair and if confirmed, another hawk would be added to the roster. There will also be 2 vacancies this year – Elizabeth Duke’s seat (she retired in summer of 2013) and Sarah Raskin’s slot once she moves over to the Treasury. Jerome Powell’s term ends January 31st but President Obama is considering a reappointment. This would leave the central bank more hawkish and willing to follow Bernanke’s proposal for reducing asset purchases by $10 billion at every meeting this year. Lael Brainard, the former Treasury undersecretary is a possible candidate to replace Sarah Raskin’s seat on the Federal Reserve Board of Governors. She stepped down from the Treasury in November and has been known to play a major role in negotiations with China and Europe during the sovereign debt crisis. Brainard is a strong negotiator who pressured European leaders for a more aggressive response to the debt crisis. Thomas Hoenig’s name has been floated around as a possible replacement for Duke. Hoenig is a former Kansas Federal Reserve President who was a vocal hawk during his time at the central bank. Finally Jeremy Stein is expected to step down from the Fed and return to teaching at Harvard in May, which means that he could leave another seat vacant. The Obama Administration will be eager to fill these slots quickly and bring the FOMC back to full capacity. The Federal Reserve’s Open Market Committee changes every year and for 2013 in particular, the new makeup of the FOMC will be extremely important because this group will decide whether asset purchases should end in 2013. Gone are Lacker (the most hawkish member of the FOMC), Pianalto (a dove), Williams and Lockhart. Three doves and one hawk will be replaced with two uber doves (Evans and Rosengren), one moderate hawk (George) and one unknown (Bullard). What this implies is that the new voting members of the FOMC may not be as eager to phase out asset purchases this year as the prior committee.